Assam government’s tall claims about “corruption free” governance are bogus. The corrupt practice of ‘cash-for-jobs’ still continues to haunt Assam. Even after the exposure of the infamous “cash-for-job” scam in the Assam Public Service Commission (APSC), some of the officials of the Panchayat and Rural Development Department have been found to be involved in a similar recruitment scam in Assam. A detailed investigations conducted by Northeast Now brought to fore the modus operandi of the officials, who made the best use of their official positions to ensure that a large section of the candidates, who were close to influential people, or had paid money to get the jobs. Written tests for the Combined Competitive Examination were conducted on May 20 across Assam for 945 jobs in the Panchayat and Rural Development Department. And, about 1.8 lakh candidates had appeared the examination. Assam government had awarded the contract to conduct the examination to a South India-based company, Bloom Electronics. Subsequently, Bloom Electronics engaged a Guwahati-based company to conduct the examinations across the state. There was loud hue and cry over the poor conduct of the examination. In some centres, there was short supply of question papers, while in other places question papers reached late. At many places, questions were already in circulation on the social media, especially on WhatsApp groups. Even question papers were not sealed before distribution. Agitated candidates staged protest demonstrations in front of the Panchayat and Rural Development office at Guwahati. The CID conducted an inquiry, while the Gauhati High Court ordered not to announce the results of the examinations. But, Northeast Now’s investigations into the case revealed that the corrupt practices of the entire racket began at the level of setting the question paper for the important examination. Assam government tried to cover up the fiasco by removing Additional Chief Secretary MGVK Bhanu from the department. But, is Bhanu’s removal a solution to the issue? The issue has raised a series of serious questions about the sternness of the examination system. First, what was the basis of selection of the person who was assigned to set the question? Second, how did the government ensure that the person who set the questions will not be involved in another cash-for-jobs scam? Thirdly, why were the questions picked up from three particular websites? Northeast Now’s investigations have found that questions were copied directly from three websites – www.onlinetyari.com, www.competoid.com and www.brainly.in. It is apparent that the questions were set from the three websites primarily to make the combined competitive examination easier for a section of candidates. But, officials of the Panchayat and Rural Development are tight-lipped about the issue. When Northeast Now contacted the joint director, S A Laskar, who was also the controller of the CCE, he even refused to name the local associates of the Bloom Electronics. “I cannot say anything on the issue. We have asked not to speak,” Laskar said, adding, “If the Commissioner grants permission, I can give you information in this matter. We do not know any employee of Bloom Electronics. We have contacted their Tamil Nadu office directly.” Laskar’s statement that he did not know anyone in Bloom Electronics is surprising. When asked why questions of such an important examination were set from some particular websites, Laskar feigned ignorance. When pointed out that detail of questions taken from these websites is in possession with Northeast Now, the joint director suggested filing an RTI to get reply from him. “Our investigation is on. If you want to know anything, file an RTI,” was his reply. 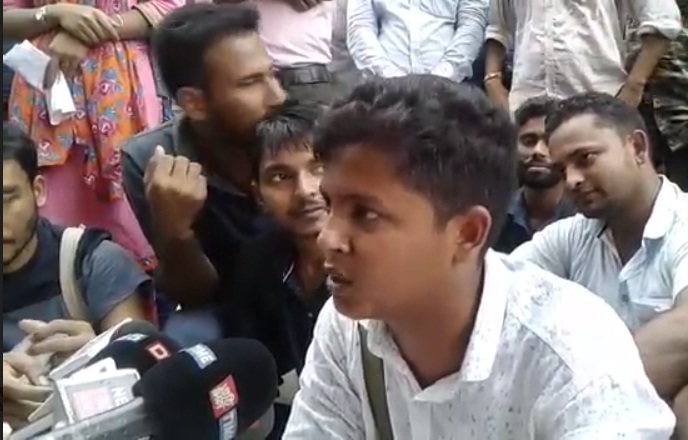 It may be mentioned that Dhubri Police on June 21 arrested two persons for their alleged role in leaking question papers of the examination. The two accused — Rupali Saha and Sabira Khatun — were arrested on the basis of a complaint lodged by an examination centre in-charge. Sabira is a resident of Dhubri town while Rupali is an inhabitant of Golakganj town of Dhubri district. The centre in-charge of the Bidyapara Boy’s Higher Secondary School of Dhubri town had informed the police about the suspicious activities of the two candidates, who allegedly used their cell phones in the examination hall and also photographed the question paper in their mobiles which were circulated on WhatsApp during the examination. A case (646/2018) was registered with Dhubri Police Station under relevant sections of the IPC.